Briefly: the ABPI have engaged in an energetic personal smear campaign, as predicted at the end of Bad Pharma. I’ll think about posting the details from leaked and external ABPI documents at some stage. I’m posting some correspondence today because the CEO and President of the ABPI have both falsely claimed to MPs and journalists that I’ve refused to meet them over many years. This is silly and untrue, especially when the ABPI have also specifically stated in public that they are refusing to engage with my concerns. Both Stephen Whitehead (CEO) and Deepak Khanna (President) have failed to provide any explanation of why they’ve made these false claims, or give a full list of the people they’ve misled, so regrettably I’m posting my letter to them here. I’m a straightforward guy, I’m happy to talk to anyone, and I think opennness is extremely important. I’m also really, really easy to find. My personal email address is ben@badscience.net, and this can be found on all my websites, in my Twitter profile, and at the bottom of most of the journalism I have ever written. I’ve had meetings with many senior figures from the pharmaceutical industry already, and have many more lined up. This is uncontroversial and unsurprising, they’ve been very interesting and constructive conversations, with agreement and disagreement. 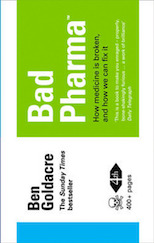 Bad Pharma is a straightforward book that gives the public an accessible account of well-documented and ongoing problems in medicine. I think it is acceptable to involve the public and politicians in discussing these problems, and I wrote the book in the hope that the public can help all of us, in all the professions around medicine, to fix these flaws. I hope that the ABPI can find a way to engage more sensibly and constructively. Since being contacted by the media about this episode, the ABPI have now changed strategy, and have now asked to meet me. I’ve said yes (of course). It is very much worth reading, I think. Lastly, here, if you’re interested, is my letter to Stephen Whitehead, ABPI CEO. I am writing to you about the ABPI’s repeated false claims that they have attempted to “engage” with me and that I have refused. As you know, this an entirely false claim, now made repeatedly by yourself and also by the ABPI president Deepak Khanna, in letters and emails that have been forwarded on to me. The ABPI have made no attempt to contact me, and the ABPI press office have failed to respond to simple questions. This kind of activity is entirely unnecessary, and in my view a great disservice to the many ethical professionals working in the pharmaceutical industry. I’d be grateful if you could send me, as soon as possible, a full list of the people you and Mr Khanna have misled. Most importantly, I am of course always very happy to meet you and others from industry, at any time: I have met with many already, and will happily continue to do so. These are serious ongoing issues relating to patient safety, and it is important that they are discussed openly rather than ignored, denied, or withheld from the public. I’m always happy to discuss better ways forward with anyone who wishes to engage in a constructive discussion! Perhaps they tried to contact you using telepathy. I have myself on many occasions tried to contact you in this way, and have been disappointed to receive no response. I also tried to engage with you using homeopathic telephony. This involves taking an ordinary telephone, dropping it in the sea and shouting at it. Defamation, surely. Your reputation, on which your income depends, is impugned. After repeated badgering I got a reply from the press office, saying that the ABPI was in contact with you. I said that wasn’t what I was asking, but no reply to that. Just got the invitation to the PharmaTimes F2F debate. Should be quite a spectacle, but the cost is outrageous. It will guarantee a biassed audience. Anyone got a press pass to spare?